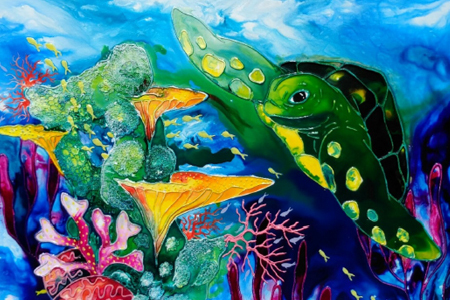 Annually the Cairns Art Society gathers together its members and other artists from Far North Queensland and presents the best of their art in one of the largest group exhibitions on Cairns’ cultural calendar. The theme of this year’s Artists of the North is Contemplating the Environment, an artists’ impression of our world’s environment, now, in the future and in the past, from the calm to the storm. Artists have always drawn inspiration from nature, producing works in homage to the environment; from landscape paintings that glorify a particular place to botanical illustrations that appreciate the diversity of species. And here in Cairns, we have an abundance to celebrate. No wonder so many residents in Cairns turn to the visual arts as a way to respond to such a grand environment.